Abertarff Castle was a very short-lived castle which was built at the southern end of Loch Ness somewhere in the vicinity of the modern village of Fort Augustus. The exact location is unknown, but was presumably in this area since the River Tarff enters Loch Ness here. The only reason that we know there was a castle at Abertarff is a record that in 1228, Thomas de Thirlestane was killed in his castle at Abertarff, which was razed to the ground. There is a wider context which we can place to this event. Alan de Thirlestane was a retainer of the more powerful Ayrshire family of de Morville, and his father Elsi had been granted the lands of Thirlestane by Hugh de Morville. Hugh had come to Scotland in the train of David I, having served under him in northern England, and became Constable of Scotland in 1138, also gaining lands in Ayrshire and the borders. As constable, he was succeeded by his son Richard in 1162, by Richard’s son William in 1189, and by William’s nephew Alan of Galloway. The constable was in charge of the royal army, and was therefore closely involved in the suppression of successive rebellions in the north of Scotland during the reigns of David, Malcolm IV, William, and Alexander II. As retainers of the constable, the Thirlestane family would have fought in the royal army, and been involved in the settlement and administration of the lands of former rebels. Alan appears in records between 1188 and 1203, but in every case these records are associated with the south of Scotland. His son Thomas is first recorded as lord of Thirlestane in 1223. At some point between 1203 and 1228, Alan’s son Thomas was involved in suppressing rebellion in north Scotland. In 1211-1212, Guthred MacWilliam led a rebellion which was largely confined to Ross; the lands north of Inverness, in 1221 the royal army was involved in a campaign near Inverness against an otherwise unrecorded Donald MacNeil, and in 1228 Gillescop MacWilliam again raised the flag of defiance on behalf of his family. It was in Gillescops rebellion that the castle of Abertarff was destroyed, suggesting that Thomas had probably been granted the lordship of Abertarff by 1221 at the latest. As an incomer and maintainer of the royal peace, he may not have been popular in this predominantly Gaelic-speaking area. Certainly as a royal representative he was a target for the supporters of the rebel MacWilliam – who had a claim to the throne, albeit increasingly weak. The castle defences were almost certainly of earth and timber, perhaps a motte or ringwork with a ditch, and once razed, it was never rebuilt. There is a small mound near the caravan park which may represent the castle, but this has not been identified as the site of the castle and may not be medieval at all. The site identified by the RCAHMS is a flat meadow, and contains no defensive site. A further possible site on the eastern shore of the loch can be seen as a prominent knoll near the mouth of the Allt Doe, but this is unlikely to have borne the name Abertarff on the surface (it should be borne in mind that on Blaeu’s map of c1654 “Abyrtorf” is shown here – adjacent to “Kilwhimen”). However, the two most likely sites are built over. 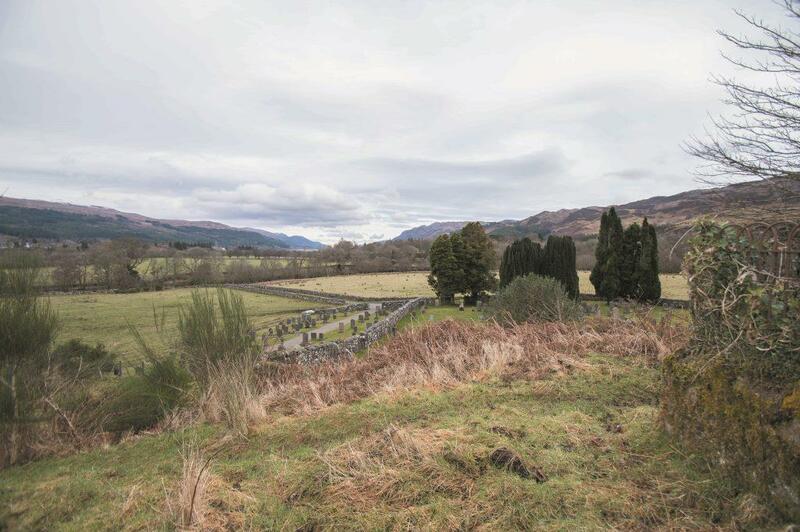 The first is the site of the 18th century Fort Augustus (also known as Kilwhimen) and later St Benedicts Abbey, which is on the shore of the loch, and early plans suggest that a castle may have predated the fort. The other is the site of the Tom na Croiche burial ground, which has defensive features and overlooks the low-lying ground. However in neither case are there any extant remains to suggest defensive features, confirming that the site of the castle has been destroyed. The lands of Abertarff later passed to the Frasers of Lovat, who did not erect a castle here.